First I’d like to say thanks to all the people who gave their ideas on this site. 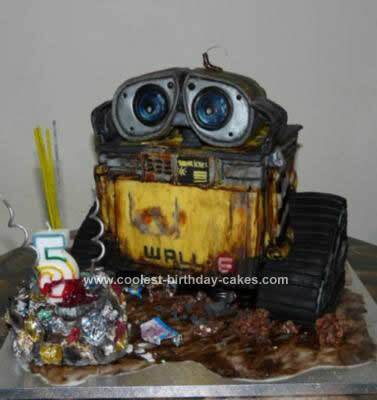 I made this Wall E 3D Birthday Cake Design after looking at your lovely cakes for my son Jake on his 5th birthday. I made one great big fruit cake in a roasting tin and cut this into 4 squares. Three of them stacked up to make the body and the 4th one was used to make the tracks and the head. I stacked the body on a thin cross shaped cake board which I balanced on a black coloured pate pot. This allowed me to have the body off the ground and also slide the side tracks over the protuberances of the cake board. I covered the body in bright yellow fondant and then painted in most of the details using a mixture of edible gel paints and powders. Any 3d parts where added on as I went along. The tracks where rounded triangles cut from the 4th square of cake and covered in black fondant. 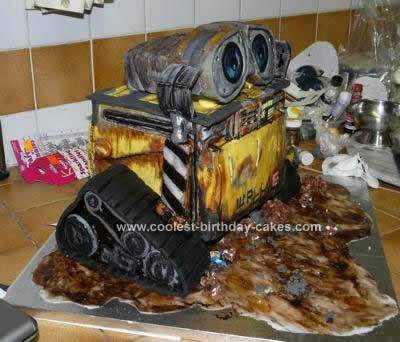 I was able to push and mold the wheels and cogs on the side of the tracks because the cake was soft. This allowed me to give it more definition especially when highlighted with the silver edible powder. I just used a large skewer to indent the actual black track fondant. The head was the hardest as I wanted it to be on a neck. I squashed all the remainder cake and trimmings into the shape for the head (I love working with fruit cake for this reason, it’s so pliable). I used a sterilized baby spoon as the structure for the neck and bent it into shape covered it with fondant and painted. Covered the head and painted in the details. Added 3d eyes made from painted fondant and also the bug (had wire for its antennae). 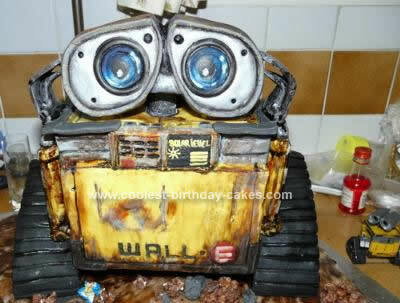 The arms were made from fondant placed around cake wire and painted. Had some old sweet wrappers which I crunched up and pushed into fondant to make the rubbish cube. This cake was hard but enjoyable to make and best of all my son loved it so much he didn’t want to share it. We had to keep the head for a couple of weeks, good job it was fruit cake.